Get your own copy of Island. 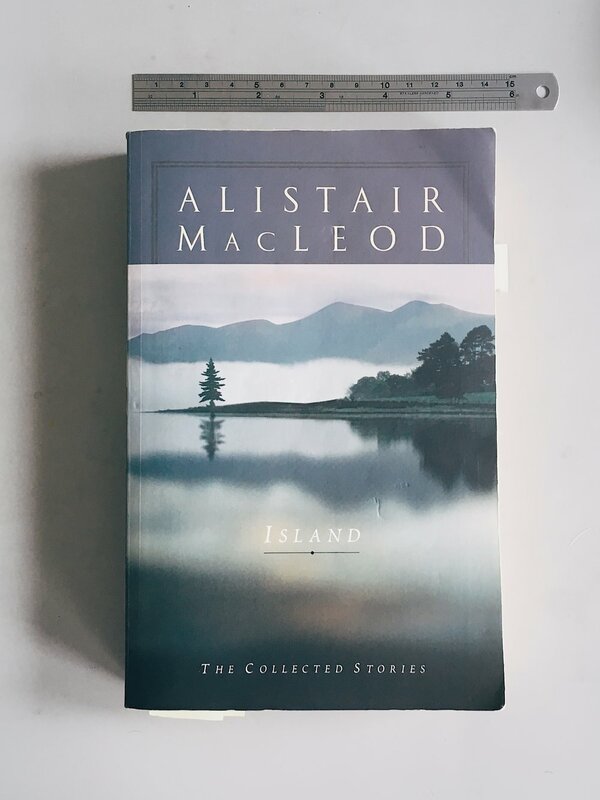 A collection of stories spanning over thirty years, Island chronicles the development of Alistair MacLeod’s writing style as much as it tells the tales of rural life on the East Coast of Canada. Paradoxically the book could be best summarized as an intimate examination of the extravagantly mundane. MacLeod explores thematic ideas from the viewpoint of three different generations—young, middle aged, and old—forcing oneself to reflect on their own life and the life you choose to lead. You will no doubt find yourself drawn to some stories more than others. Some of the tales read like folktales, while others feel like intimate biographies. I quite enjoyed “The Lost Salt Gift of Blood” (1974), “The Closing Down of Summer” (1976), Winter Dog (from 1981), “The Tuning of Perfection” (1984), and “Clearances” (1999). “Yet in spite of it all, the stars shine clearly down. It will indeed be a good day for the fishing and this wind eventually will calm. The salt hangs heavy in the air and the water booms against the rugged rocks. I take a stone and throw it against the wind into the sea.” (pp.136-137). “Standing unsteadily on one foot when required I manage to undress, draping my trousers across the wooden chair. The bed is clean. It makes no sound. It is plain and wooden, its mattress stuffed with hay or kelp. I feel it with my hand and pull back the heavy patchwork of quilts. Still I do not go into it. Instead I go back to the door which has no knob but only an ingenious latch formed from a twisted nail. Turning it, I go out into the hallway. All is dark and the house seems even more inclined to creak where there is no window. Feeling along the wall with my outstretched hand I find the door quite easily. It is closed with the same kind of latch and not difficult to open.” (pp.136-137). “Now my wife seems to have gone permanently into a world of avocado appliance and household cleanliness and vicarious experiences provided by the interminable soap operas that fill her television. She has perhaps gone too deeply into that life as I have into the life of the [mine] shafts, seeming to tunnel ever downward and outward through unknown depths and distances and to become lost and separated and unavailable for communication. ...Perhaps we are but becoming our previous generation.” (pp193). “It would be of little use now to whisper popular lyrics into my ears for I have become partially deaf from the years of the jackleg drill’s relentless pounding into the walls of constant stone. ….most of us have long abandoned the modern hit parades and have gone, instead, back to the Gaelic songs remembered from our early youth. ...We have perhaps gone back to the Gaelic songs because they are so constant and unchanging and speak to us as the privately familiar. ...It was not until the isolation of the shafts started that it began to bubble up somehow within me… as if it had sunk in unconsciously through some strange osmotic process while I had been unwittingly growing up.” (pp194). “Yet perhaps those who go find in the regions to which they travel but another kind of inarticulate loneliness. Perhaps the dentist feels mute anguish as he circles his chair, and the lawyer who lives in a world of words finds little relationship between professional talk and what he would hope to be true expression. Perhaps he too in his quiet heart sings something akin to Gaelic songs, sings in an old archaic language private words that reach to no one. ...I have always wished that my children could see me at my work. That they might journey down with me in the dripping cage to the shaft’s bottom or walk the eerie tunnels of the drifts that end in walls of straing stone. And that they might see how articulate we are in the accomplishment of what we do. That they might appreciate the perfection of our drilling and the calculation of our angles and the measuring of our powder, and that they might understand that what we know through eye and ear and touch is of a finer quality than any information garnered by the most sophisticated of mining engineers with all their elaborate equipment.” (pp199). “The coming of the big ice marked the official beginning of the coldest part of the winter. It was mostly drift ice from the Arctic and Labrador, although some of it was freshwater ice from the estuary of the St. Lawrence. It drifted down with the dropping temperatures, bringing its own mysterious coldness and stretched for hundreds of miles in craters and pans, sometimes in grotesque shapes and sometimes in dazzling architectural forms. It was blue and white and sometimes grey and at other times a dazzling emerald green.” (pp257-258). A story of Archibald, who was a man who “thought of himself, in the middle of that April, as a man who had made it through another winter. He was seventy-eight years old and it seems best to give his exact age no, rather than trying to rely on such descriptions as ‘old’ or ‘vicarious’ or ‘younger than his years’.” (271). Nearing the end of his life the chapter depicts the life he has lived and how he chooses to bring it to a close. “During the remainder of the week, he tried to do it all. Aided by the information on the scraps of paper and his new-found friends and friends of friends, he went on boats up the inland lochs and across the straits to the offshore islands which he found inhabited mainly by wind and crying seabirds. ...In the evenings around the hospitable whisky bottle he tried to explain the landscape of Cape Breton.” (pp420).